I’ve been meaning to organise the shed for years. It was cold, messy and full of clutter, with nowhere to put anything. So seeds and tools started to spread around the house. 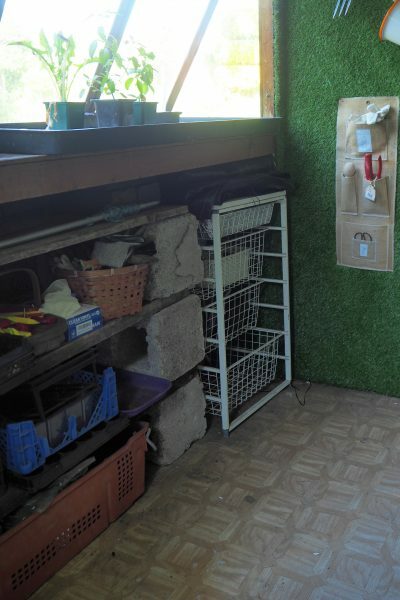 Before and after – my life has been transformed by adding insulation, artificial turf and lots of storage. I decided to ask a young artist, William Ford, to use his creativity and ingenuity. William has recently graduated from Bath and I’d been impressed by an exhibition he’d put on here in Faversham with some fellow artists. He’s good at making and recycling. So I hoped he’d be able to reuse and upcycle some of the stuff we have lying around, rather than buying new. 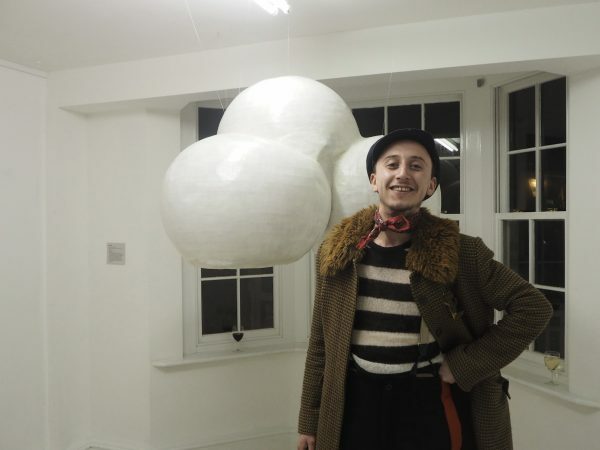 William Ford and one of his installations at a recent exhibition. Links to Amazon are affiliate links, which means I may get a small fee if you buy. However it won’t affect the price you pay, and all items are also easy to find in your local shops (or you may have them anyway). I explained that I wanted to be able to keep seeds and fertilisers in the shed. At the moment, it gets either very hot or very cold. Extremes of temperature aren’t good for seeds. It was also important to improve the storage. I had a few shelves and some hooks, but it was all pretty chaotic. William decided that it was important not to have storage jutting out – it’s a small space. So he built shelving out of scaffolding planks and breeze blocks and put them under the potting shelf. And, finally, I wanted somewhere to shoot garden videos for the Middlesized Garden YouTube channel. The big window in the potting shed gives a good light. So if we could organise the shed properly, it would be much easier than chasing around the house, constantly having to move the furniture. And to be absolutely honest, I was rather envious of the allotmenteer YouTubers, who broadcast their videos from charming sheds. These are painted in soft colours, such as duck egg blue (Agents of Field) and hung with bunting and vintage wallpapers (Homegrown.garden and Lavender & Leeks). They brew up tea on camping stoves with old-fashioned kettles that whistle. It’s all wonderfully atmospheric. But it wouldn’t make sense in a middle-sized garden shed, which usually has a well-equipped kitchen, complete with electric kettle, just a few steps away. 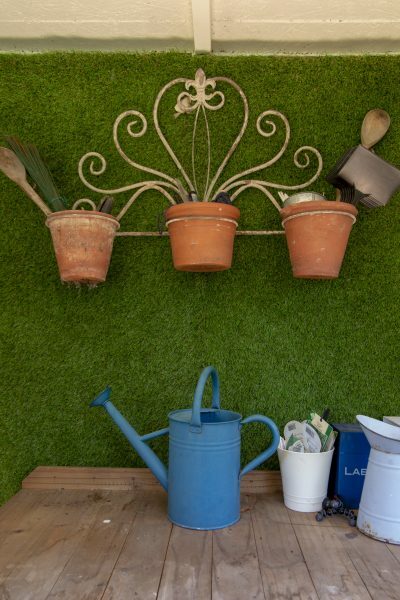 So we felt our potting shed makeover would need a different approach. 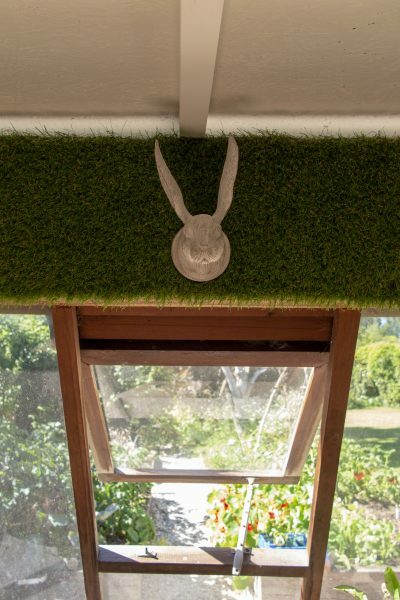 William decided to keep the atmosphere as simple as possible, with artificial turf and hanging storage. William says that, at first, he wanted to think up lots of clever ideas. But he decided that when you organise the shed, simplicity has to be the key principle. The shed has to work. So he had one big decorative idea, which was to use artificial turf on the walls. The view from my newly upcycled potting shed with its artificial turf walls. 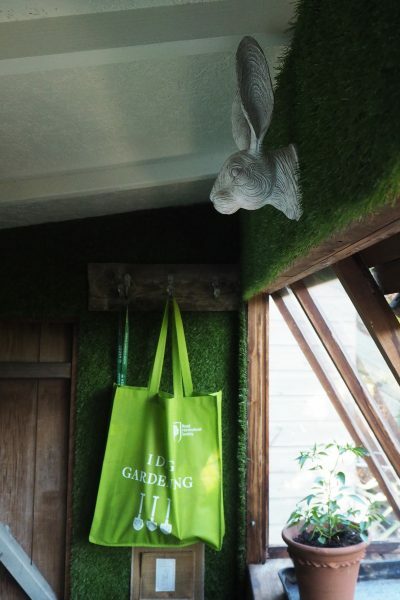 The hare was a present from a friend, and we decided he looked rather fun poking his head out of the new ‘green’ walls. I wanted the shed ceiling painted white to improve the light. 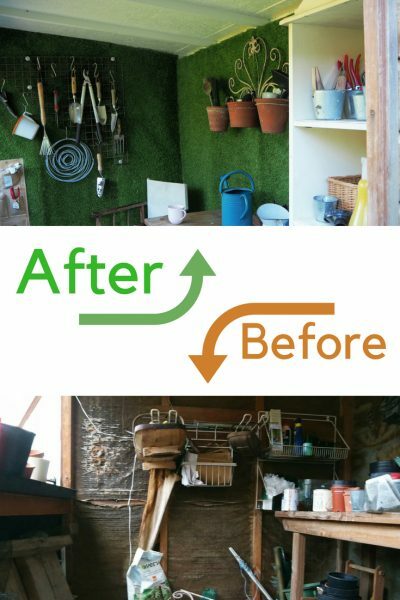 The rest of the shed makeover was about creating simple, effective storage for big and small items. I wanted to make sure that the artificial turf would be a good background for filming. The colour behind you makes a big difference to skin tone in a video – it can be the difference between looking like a healthy, normal human being or a grim and terrifying ghost. And if you’re going to be doing photography or Instagram in your shed, then the background and the light will be important. By coincidence I was going to a WordPress workshop at Dragon Co-working in Chatham (excellent, do go if you are local). Dragon Co-working has artificial turf on its floor, so when no-one was looking, I was able to lie on the floor and sneak a selfie. 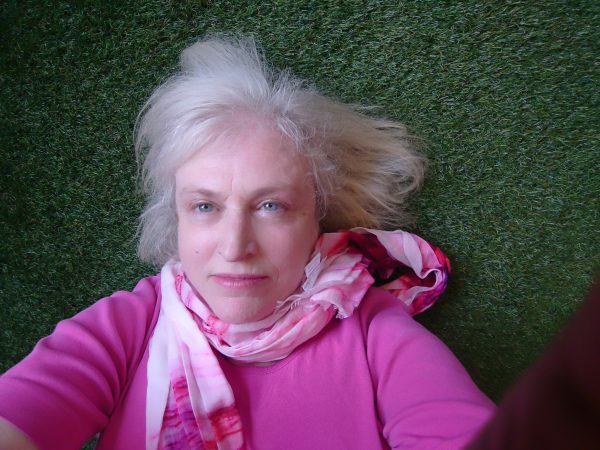 To check whether artificial turf would be a good background, I snuck a selfie in on the floor of Dragon Co-working – if you want to use your shed for photography, it’s worth thinking about the light and about the colour of the background. I also asked William to paint the shed ceiling white, in order to reflect the light better. I’d asked for insulation. This was quite straightforward. 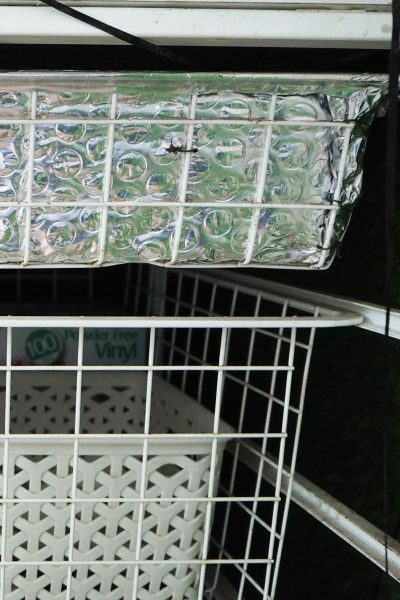 William bought sheets of foil bubble wrap insulation from a DIY store and used a staple gun to fix them to the shed frame. He also insulated a drawer for me, to give seeds a bit of extra insulation. William used a bit of leftover insulation material to line the top drawer and also the top of this chest, just to give seeds a little extra protection from extremes of heat and cold. Because of the size of the potting shed window, and because there is a slight gap below the roof of the potting shed, it will never be fully insulated but it’s definitely less extreme now. Artificial turf is quite heavy, so William used three methods to fix it to the walls. Firstly he used double-sided carpet tape all around the edges of each panel of the insulating foil. Then he used a glue gun, going from left to right and back again, all over the insulation material. Once the artificial turf was fixed with the glue and carpet tape, he then nailed it to the shed walls to make sure it stays in place. You can see how he did it in this video below, as well as more footage on how terrible the shed looked at the beginning! We wanted to re-use and adapt as much as we could. 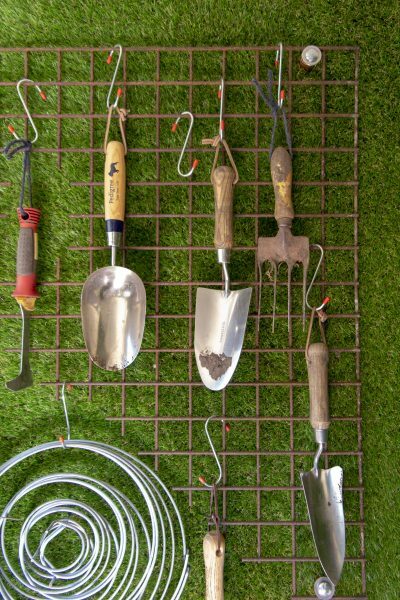 In the end, the only new materials that William bought were the insulation, the artificial turf, some very short lengths of copper piping and some new S hooks. He found some concrete breeze blocks in the basement, and acquired some old scaffolding boards. As my main expense was William’s time, I didn’t want him to build shelves. He made shelves by simply putting boards on top of breeze blocks. It’s quick and also flexible – if we need to change the storage we can. He also found a couple of old wire basket drawers we had bought years ago, probably from IKEA. I haven’t been able to find anything similar online, so perhaps they aren’t made any more. But any chests or drawers that you don’t use would work as well. Free-standing wire basket drawers and shelves made of breeze blocks and old scaffolding boards, tucked under the potting bench surface. There’s a hanging organiser from Nutscene Twine, although they don’t seem to do these any more. Hanging tools on hooks makes them easy to get at and also to put away. William found an iron grid that had been part of a safety cover for a pond. A bit of old safety grid from a pond, secured to the wall with short stubs of copper piping and hung with S hooks – the perfect tool holder. William started to organise the shed by using pots for lots of different things – these old terracotta pots are used for labels, ties, pencils and a couple of rulers. I bought this ‘shabby chic’ plant pot holder several years ago on a whim, but had never found a place for it before. Three more hooks on a leftover piece of board add extra hanging space just beside the door. 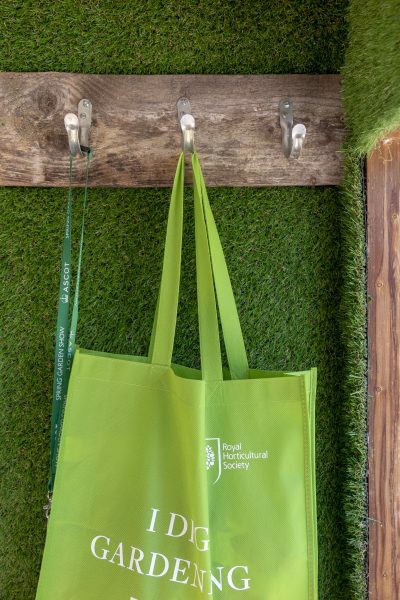 The bright green RHS bag fits in very well, I think. We’ve just opened our garden for Faversham Open Gardens and Garden Market Day, so we’ve been doing alot of last minute gardening. A friend has been helping me weed, but it’s all been so much easier because everything in the potting shed is easy to see, easy to find, and easy to put away. 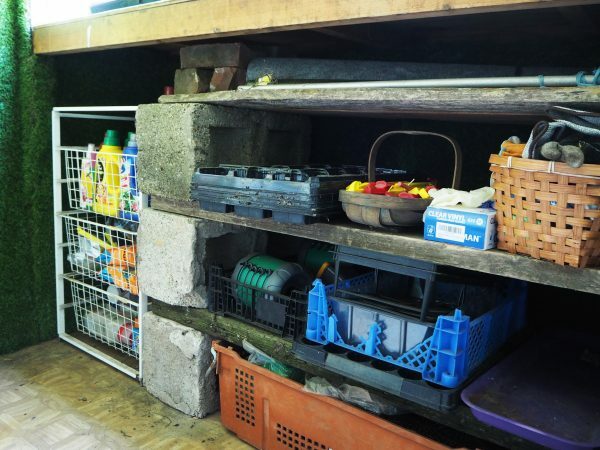 For a closer-up view of how William organised the shed, see this video. It’s also got how to attach the insulation and the artificial turf. 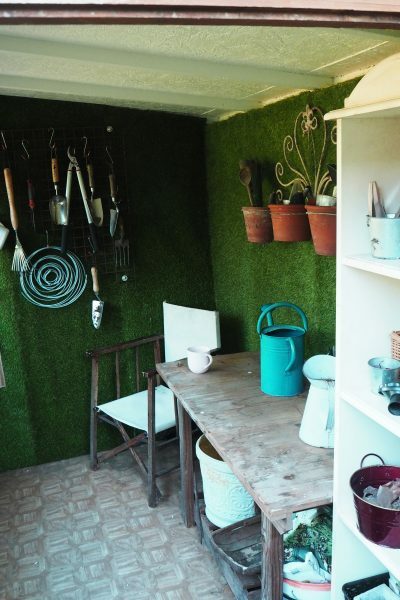 6 comments on "How to upcycle and organise the shed"
Wonderful transformation of your space! I’ve pinned this for inspiration on dealing with my old, drafty garage that must serve as storage for car, bikes, barbecue, tools PLUS many pots, seed packets, soil amendments, etc. Thank you!! Thank you – I hope the garage transformation goes well. Creativity and practicality in perfect harmony. I have just got a new shed too, and I was quite pleased with it until I saw this!! Young William a great Find! Looking forward to seeing your new shed!